(Mobile, AL) – In the wake of Hurricane Michael, the United Way partner agencies and families in affected areas will lean on their neighboring communities for assistance in the relief and recovery process. As the community safety-net, several United Way of Southwest Alabama (UWSWA) partner agencies will be among them. Over the days and weeks ahead, the agencies will provide services for the victims of Michael, as well as the services they provide every day. Today, UWSWA needs your help to replenish the resources required to do all the work needed. When you donate to UWSWA, you help fund all the partner agencies working in our community and across the Gulf Coast in relief and recovery efforts. Visit www.uwswa.org to give. UWSWA Partner Agencies Working With Victims of The Storm. The Red Cross opened and ran an evacuation shelter in Robertsdale. They are preparing to shelter medical patients that may be sent from destroyed hospitals. They have sent their Emergency Response Vehicle with some volunteers over to Florida to assist with feeding and will deploy many volunteers to the disaster relief operation. Executive Director, Mike Brown, will deploy to Panama City this Sunday. Feeding the Gulf Coast serves 24 counties across the Central Gulf Coast, including seven counties in the panhandle of Florida, from Escambia County in the west, to Bay, Holmes, and Washington counties in the east. They are working with Feeding Florida and Feeding America to coordinate disaster response efforts with area Emergency Management Agencies and our partner community organizations in these areas. As they respond to this disaster, they will work around the clock to make sure people in affected communities get the food and water they need to get through this disaster. They will enter affected areas to provide food relief once it is safe to do so by area Emergency Management. Over the next two weeks, they will send trucks of water and Meals Ready to Eat (MREs) to affected areas as determined by the Florida Division of Emergency Management. Electricity is expected to be unavailable in these areas for at least two weeks, so the immediate needs are water and MREs. Currently, they are seeking warehouse space in Bay County for short-term lease so they can have supplies directed to that warehouse for more efficient distribution to the public. They will share distribution locations and times with the public as soon as they are able. Once power is restored to areas, they will expand to distributing food boxes. GESGC is providing vouchers for storm evacuees to supply them with free clothing and other goods from all their mobile stores, including Baldwin County and the Florida panhandle stores. 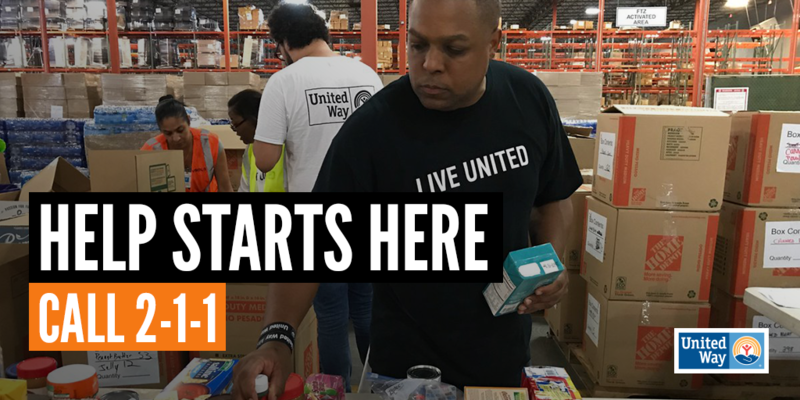 United Way 2-1-1 is a free hotline that provides information to individuals seeking community resources like shelter, food and water, recovery support, and other basic needs, before, during and after disasters. The service is available in 180 languages 24/7 by simply dialing 2-1-1 or visiting 211.org. Hurricane Michael information and updates are now also available by texting MICHAEL to 898-211. 2-1-1 serving impacted areas are all operational and United Way Worldwide (UWW) is coordinating support to ensure calls are answered even with widespread power outages, staff evacuating, and in anticipation of staff fatigue as the storm response progresses. UWW have asked the 2-1-1 network for additional volunteers to answer calls and texts if needed. Both of TSA feeding units are already in-service feeding those impacted by this latest storm and first responders. One, three-member crew, is serving in Dothan, Alabama, and one, two-member, crew is serving in Pensacola, Florida. TSA also provides access to long term recovery resources for residents in need of assistance. UWSWA created a Hurricane Michael Recovery “initiative” for agencies to use to post needs related to the recovery effort. As agencies create their volunteer needs related to Michael, they should select “Hurricane Michael Recovery” from the “initiative” dropdown. This will cause those needs to be added to a special page that will appear on the front page of Volunteer Connect as soon as the first recovery-related need is posted. That special initiative page can be shared, and as additional needs are posted using the initiative, that page will update automatically. Anyone wishing to volunteer or help with the recovery effort will find the most up-to-date listing of needs based on what you share. Visit http://volunteer.uwswa.org to post a need or find a volunteer opportunity.